Swarovski Tripods offer the highest quality, and coupled with the Swarovski Tripod Head FMS Fast Mount System, you will have a smooth support and quick mounting and dismounting of your spotting scope. 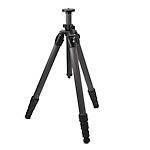 Swarovski tripods are lightweight and durable, perfect for normal, semi-low and low angle observation. Both AT101 (aluminum) and CT101 (carbon fiber) tripods have 3-section legs with lever locks, and the AT101 extends to a maximum height of 79 inches with a head. CT travel tripods are compact, carbon fiber tripods with 4-section legs and compress to fit in a suitcase. All tripods are available legs only or paired with the DH 101 head.